Do not add crawfish to ponds with vinyl or flexible liners. Crawfish like to burrow and they will tear a hole in the liner to dig into the dirt below. Make sure your crawfish can't get out of your pond. Crawfish can crawl very long distances, and could end up in your neighbor's yard. Crawfish will eat small fish. If you do not want your crawfish to be eating your pond fish make sure the fish are at least the same size as your crawfish. If your pond gets too much sunlight place an umbrella or shadecloth over the pond. Watch your crawfish play and fight with each other by viewing them at night with a flashlight. When combined with pond fish, crawfish rarely over-populate a pond. The fish eat the new crawfish and the crawfish eat the fish eggs. Crawfish are freshwater crustaceans with exoskeletons that look like miniature lobsters. Also called crawdads or crayfish, they are commonly boiled and eaten at picnics and barbeques. However tasty they may be, they make interesting pets in aquariums or ponds and are easy to care for. While the average size of an adult crayfish is about three inches, they have been known to grow as long as six inches. 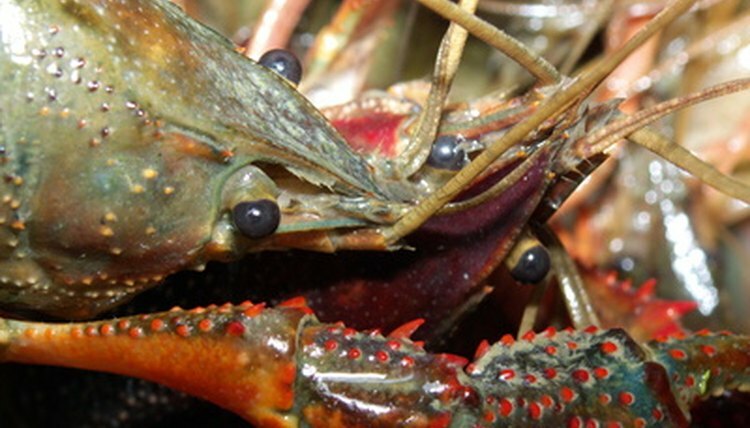 Crawfish are generally shy but become energetic and entertaining in the early evening, and as they are nocturnal they are quite active at night. Position the pond liner in a flat area in your yard out of direct sunlight. An area that gets shade all day long is best, to avoid the pond water getting too hot. Make sure there are no overhanging branches or bushes near the pond. Crawfish are notorious for escaping from their ponds and aquariums. Add three inches of gravel and dirt to the bottom of the pond to give the crawfish some places to burrow. They will dig holes and hide during the day. Place sticks and rocks on top of the gravel in the middle of the pond and arrange to provide shelter and a hiding place. Fill the pond with water to within three inches of the top lip of the liner. Add the aquatic plants. Weight down submerged plants to give the crawfish a place to hide. Let your crawfish loose in your pond and watch them to see where they head. If you've set the bottom of the pond up well they will immediately scurry under sticks, rocks and plants. Watch them in the evening when they begin to explore to make sure you haven't inadvertently given them an escape route. Feed your crawfish sparingly. A few pellets of fish food is all each crawfish will need every other day. If there are a lot of plants or fish in the pond they might not need to be fed at all, as they will eat decaying vegetation, small fish and insects.